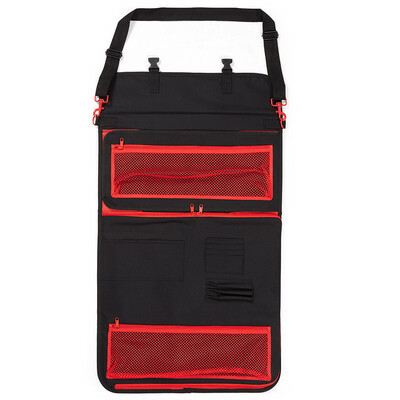 Highly functional large chef`s knife bag with a reliable case and storage. Cutting Edge. Detais: Oxford Satchel bag with flap and shoulder strap, PVC holder and clip closure, Front name card holder, 9 inner utensils holder with Hook-Pile tape and zip closure for safety, 8 exact utensils holder, 1 big outer pocket with zip closure, Inside has 1 ipad pocket, 2 mesh pockets, 3 pen inserts and 4 business card holders. Colours: Black/Red. Sizes: once size.